I don’t recall when I first met Saeki-san. Perhaps it was when I saw him working hard as one of the organizing staff at the national anti-nuke rally in Kyoto… This was a two-day rally and symposium that took place in the depressing atmosphere after the Three Mile Island nuclear accident, but the name of the citizens’ organization, Hangenpatsu Medaka no Gakko (the Anti-nuke Killifish School), left me with a fresh impression. In this school, it was hard to tell who were the students and who were the teachers– rather than who was teaching whom, everyone was learning and everyone communicating. I think it was a pioneering instance of the way of thinking which leads citizens’ movements to bring about political change. I later met him at anti-nuke rallies at nuclear power plants from time to time, but especially important was when we (Nanatsumori Publishing House) published a book “A Nuclear Phaseout: Now the growth rings are clear – Nuclear power plant sites after Fukushima” (edited by the Anti-nuke Movement National Liaison Association) at the end of September 2012, 18 months after the TEPCO Fukushima Daiichi Nuclear Power Station accident. As Saeki-san was the facilitator of the Anti-nuke Movement National Liaison Association, he was deeply involved in the planning and editing of the book. He wrote for us, “Firstly, let’s make full use of the overall situation, not just focus on the smaller scale of each nuclear power plant.” When I went to Kyoto, I decided to take one of the books for him. The festival was the “Zuiki Festival,” a representative autumn festival of Kyoto that had first started around the year 1,000 CE. The shrine is far more splendid than the Tokyo Yushima Tenjin Shrine and seems larger than even the Kanda Myojin. 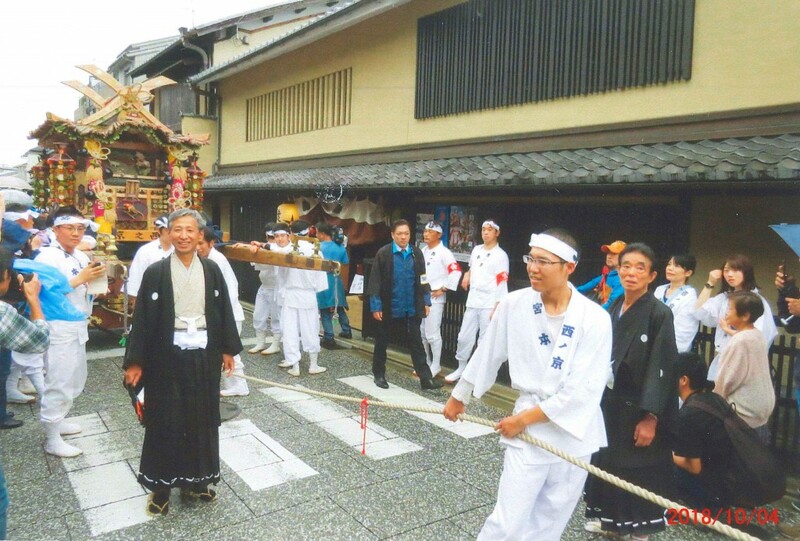 In the festival, the shrine parishioners offer a fine portable shrine made from taro stems and autumn vegetables and carry the shrine around the neighborhood. Saeki-san was the vice chairman of the festival committee (he is currently the chairman). Stalls were set up for the evening festival in the grounds of the shrine, which was bustling with people, but almost none of them were tourists. It was a relaxed festival with nearly all participants being local people. The nights are dark in Kyoto, but at a street corner on my way back, I could still hear the joyful sounds of the festival. Saeki-san does organic farming in Kyoto City, growing Kyoto vegetables, which he sells in front of his shop at his home; I’m having him send me a box of them twice a month. They are simply super-delicious! A person I know who is researching organic farming and who has a Ph.D. in agriculture says, “Vegetables have the taste of the person who grew them.” “Saeki-san’s vegetables have a stubborn taste, don’t you think?” I can detect strong willpower hidden away in his soft-spoken Kyoto dialect.